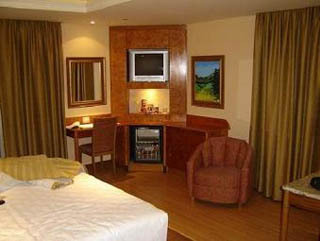 As the big tourist destination it is there are many Rio de Janeiro hotels. You have everything from top of the range luxury hotels to cheap and sleezy bachelors establishments. I have written a little advise that might be useful in your choice of hotel; there is also a few other related tips and hints. Most of the Rio de Janeiro hotels are located in Copacabana but there are many more in other neighbourhoods. The more swanky ones, like Copacabana Palace Hotel and Hotel Fasano, are located at the beach front in either Copacabana or Ipanema; The one exception would be Hotel Glória located in… Glória. Along the beach avenues there are many hotels in other price ranges but you wouldn’t find anything under mid-range. The ones located one or two streets back are in general cheaper but never a bargain. The really cheap options you have in neighbourhoods like Lapa and in Catete; bachelor hotels or just very basic ones. I also discuss this on my Accommodation in Rio page, but here it is again: The prices vary a lot depending on season, holidays and events. Don’t even dream about getting the same deal you do in October in January! Over Carnival and New Years prices go up maybe 5 or 6 times, that is if you would be able to find vacancies. The cheap deals are made off-season. Bear in mind that here, just like anywhere else in the world, hotels try to get as much as they can from their guests. That service that will take you to a football game is probably a lot more expensive than a similar in say a hostel. It is not the tour operators that jack the prices up, it is the hotels themselves. On the other hand: If you are already in a hotel you can probably pay the difference in exchange for the convenience.